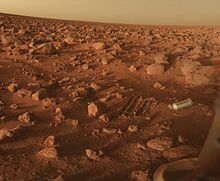 An example of an additional object from a spacecraft landing is the metal shroud ejected by the Viking 2 lander, as seen in this 1977 view of Mars. The shroud covered the surface sampler instrument and could be seen in images taken by the lander while it was active on the surface. The following table is a partial list of artificial objects on the surface of Mars, consisting of spacecraft which were launched from Earth. Most are defunct after having served their purpose, but the Curiosity rover and the InSight lander are still operational as of 2018. InSight is the most recent artificial object to land safely on Mars. The table does not include smaller objects, such as springs, fragments, parachutes and heat shields. As of November 5, 2016, there are about 14 spacecraft missions on the surface of Mars: some of these missions have multiple spacecraft. In this listing, it is implied that each mission left debris according to its design. For example, the Schiaparelli EDM lander likely exploded on impact, creating an unknown number of fragments at one location. At another location, there may be a lower heat shield, and at another location, a parachute and upper heat shield. Another example is the counterweights ejected by MSL during its descent. In some cases, the nature and location of this additional debris has been determined and, in other cases, even the location of the main spacecraft has remained unknown. The identification of Beagle 2 after 11 years is one of the greatest breakthroughs yet, since prior to that, it could not be confirmed what had happened. Spacecraft that have not been precisely located include Mars 2, Mars 3, Mars 6, Mars Polar Lander, and the two Deep Space 2 probes. Mariner 9, which entered Mars orbit in 1971, is expected to remain in orbit until approximately 2022, when the spacecraft is projected to enter the Martian atmosphere and either burn up or crash into the planet's surface. Pennants of Soviet Union on Mars 2 and Mars 3 landers (1971). Thomas Mutch Memorial Station, the Viking 1 lander (1976). Gerald Soffen Memorial Station, the Viking 2 lander (1976). Carl Sagan Memorial Station, Mars Pathfinder (Sojourner) base (1997). Challenger Memorial Station, MER-B (Opportunity) landing site area (2004). Columbia Memorial Station, MER-A (Spirit) landing site area (2004). Green Valley, the Phoenix lander (2008). InSight Landing, the InSight lander (2018). Interactive imagemap of the global topography of Mars, overlain with locations of memorial sites on Mars. Hover your mouse to see the names of over 25 prominent geographic features, and click to link to them. Coloring of the base map indicates relative elevations, based on data from the Mars Orbiter Laser Altimeter on NASA's Mars Global Surveyor. Reds and pinks are higher elevation (+3 km to +8 km); yellow is 0 km; greens and blues are lower elevation (down to −8 km). Whites (>+12 km) and browns (>+8 km) are the highest. Axes are latitude and longitude; Poles are not shown. ^ "NASA NSSDC Master Catalog - Mars 2". Retrieved 2010-12-24. ^ "NASA NSSDC Master Catalog - Mars 3". Retrieved 2010-12-24. ^ "NASA NSSDC Master Catalog - Mars 6". Retrieved 2010-12-24. ^ "NASA NSSDC Master Catalog - Viking 1 lander". Retrieved 2010-12-24. ^ "NASA NSSDC Master Catalog - Viking 2 lander". Retrieved 2010-12-24. ^ "Mars Pathfinder". Retrieved 2011-12-07. ^ "NASA NSSDC Master Catalog - Mars Pathfinder". Retrieved 2010-12-24. ^ "NASA NSSDC Master Catalog - Mars Pathfinder Rover". Retrieved 2010-12-24. ^ "NASA NSSDC Master Catalog - Mars Climate Orbiter". Retrieved 2010-12-24. ^ "NASA NSSDC Master Catalog - Mars Polar Lander". Retrieved 2010-12-24. ^ "NASA NSSDC Master Catalog - Deep Space 2". Retrieved 2010-12-24. ^ "NASA NSSDC Master Catalog - Spirit Rover (MER-A)". Retrieved 2010-12-24. 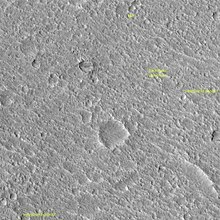 ^ "ESA Mars Express - Spirit Rover landing site image and coordinates". Retrieved 2010-12-24. ^ "NASA NSSDC Master Catalog - Opportunity Rover (MER-B)". Retrieved 2010-12-24. ^ Squyres, S. W.; Arvidson, R. E.; Bollen, D.; Bell, J. F.; Brückner, J.; Cabrol, N. A.; Calvin, W. M.; Carr, M. H.; Christensen, P. R.; Clark, B. C.; Crumpler, L.; Des Marais, D. J.; d'Uston, C.; Economou, T.; Farmer, J.; Farrand, W. H.; Folkner, W.; Gellert, R.; Glotch, T. D.; Golombek, M.; Gorevan, S.; Grant, J. A.; Greeley, R.; Grotzinger, J.; Herkenhoff, K. E.; Hviid, S.; Johnson, J. R.; Klingelhöfer, G.; Knoll, A. H.; et al. (2006). "Overview of the Opportunity Mars Exploration Rover Mission to Meridiani Planum: Eagle Crater to Purgatory Ripple" (PDF). Journal of Geophysical Research. 111. Bibcode:2006JGRE..11112S12S. doi:10.1029/2006JE002771. E12S12. Archived from the original (PDF) on 2012-03-19. Retrieved 2010-12-24. Opportunity Rover (MER-B) coordinates on pg. 2. ^ "NASA NSSDC Master Catalog - Phoenix Mars Lander". Retrieved 2010-12-24. ^ "NASA Evaluates Four Candidate Sites for 2016 Mars Mission". NASA. 4 September 2013. Retrieved 4 September 2013. ^ "Single Site on Mars Advanced for 2016 NASA Lander". NASA. 4 March 2015. Retrieved 16 December 2015. ^ "Curiosity Landing Site Named for Ray Bradbury". NASA. August 22, 2012. Retrieved August 24, 2012.